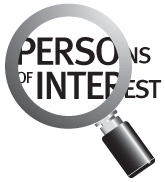 “Persons of Interest” is a weekly series exploring the lives of students, staff and faculty, both on- and off-campus. BERKELEY — Tension-spoked wheels. Triangular metal frame. Crank-and-chain drivetrain. The bicycle is perhaps man’s simplest means of self-propelled transportation. For graduate student Christopher Ategeka, however, the humble machine propelled him on a journey from the dirt tracks of East Africa to Oakland’s asphalt streets and the lecture halls and labs of UC Berkeley. “Just a few years ago, I didn’t have anything, not even shoes on my feet,” says Ategeka, recalling the struggles of childhood as an AIDS orphan in rural western Uganda. “The day I got my first bike, my life changed completely,” he adds. Today, the 28-year-old, who completed his master’s degree in mechanical engineering in double-quick time last year, splits much of his time and energy between the no-cost bicycle nonprofit he launched to empower disadvantaged Ugandans and the biotech startup he co-founded recently to tackle the spread of HIV/AIDS in Africa. In April, GoodWheels, a spin-off project of Ategeka’s Uganda-based social venture, CA Bikes, picked up the second-place award in the scaling-up category of Big Ideas @ Berkeley. Privail, a second student-led startup co-founded by Ategeka, is also working to develop an HIV early-detection kit that could be deployed across AIDS-ravaged Africa. Later this month, his scrap-into-bicycles venture will vie for a hefty $80,000 prize as a finalist in the nationwide “Echoing Green” startup competition. The eldest of five children, Ategeka found himself orphaned at age 7 as Africa’s AIDS epidemic claimed the lives of both his parents. For the next few years, the “little man” struggled to balance schoolwork with the responsibilities of helping to care for himself and his younger siblings. Preparing food, fetching water, collecting firewood, washing clothes, milking cows, taking care of crops, Ategeka would routinely rise at 4 a.m. to complete household chores in readiness for the three-hour walk to school. Returning to his small village after dusk, the end-of-day chores left little time or energy for studies before the welcome respite of bed. After enduring years of hardship, Ategeka’s fortunes took a turn for the better when he came into contact with U.S. aid organization Y.E.S. Uganda, which offered to pay the then 15-year-old’s school fees and help support the orphan and his siblings with additional money. The group’s director, Hawaiian expatriate Carol Adams, took a special interest in the bright but burdened Ategeka, handing him a very special two-wheeled gift to ease his tiring school commute. With more time and energy to devote to his studies, he began to excel in science and mathematics, going on to earn high honors in Uganda’s national examinations at the end of high school. The day I got my first bike, my life changed completely. Impressed by Ategeka’s academic excellence and potential, Michael and Martha Helms — the American couple who had been sponsoring Ategeka through Adams’ aid agency — invited the young man to come live with them in their Oakland home so he could continue his education here in the United States. “What can you say to someone who has changed your life forever? There are no words to express the gratitude, the joy. I just broke into tears,” Ategeka says of the day in 2006 when he stepped off the airplane at San Francisco International Airport and into a whole new world. “The culture shock was overwhelming at first,” he says. “Everywhere I turned everything was new to me. Ategeka transferred to Berkeley from Oakland’s Laney Community College in 2009. He capped off his bachelor’s degree by delivering one of the student speeches at the College of Engineering’s commencement ceremony in 2011, before starting his graduate studies the following semester. Inspired by his own experience of hardship, good fortune and random acts of kindness, Ategeka set out to empower his former countrymen one bicycle at a time. As a senior at Berkeley, he landed the $25,000 Judith Lee Stronach prize for undergraduate research, returning to rural Uganda to launch his “Pedal or Power” project. Focused on improving living standards and access to education and healthcare in rural communities, the project aimed to teach people how to build, refurbish and maintain bicycles using junk metal and old parts. 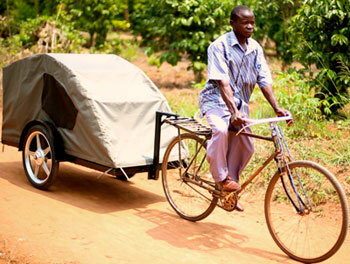 CA Bikes distributes free bicycles to empower people in rural Uganda. “In rural areas, it’s not uncommon for the nearest hospital to be 10 miles away and for people to have to haul their pregnant wife on their back or carry their sick child by stretcher or load their injured mother into a wheelbarrow for the journey,” Ategeka says. After his undergraduate project came to an end, Ategeka established CA Bikes in the market town of Fort Portal — some 200 miles west of the Ugandan capital, Kampala — to continue the initiative, which distributes bikes at no charge to orphans, school children, disabled adults, HIV patients and farmers. Employing design- and fabrication-techniques mastered by Ategeka at Berkeley, CA Bikes builds bicycles, hand-powered tricycles, wheelchairs, rickshaws and ambulance trailers that can be attached to a bicycle or motorcycle. The organization has expanded in scope, generating additional income to fund operations through the sale and rental of bikes, rickshaws and cycles upgraded with small 60-cc engines. “I hope to expand CA Bikes across Uganda, then to neighboring countries like Congo, Kenya and Rwanda, and maybe even the rest of Africa,” Ategeka says. While CA Bikes continues to grow, the medical-device startup Ategeka co-founded with an interdisciplinary team of Berkeley students is also evolving apace. In May, Privail was one of the winners of the College of Engineering’s enterprise and technology competition, VentureLab. “Growing up, I saw death, after death, after death, including both my parents, so that’s my real motivation here because the earlier you can detect HIV in infants, the sooner you can start treatment and the better the chances of preventing full-blown AIDS,” Ategeka says. Even as he looks to the future, Ategeka can’t help but keep the past close to heart and hand, scribbling down his experiences, thoughts and memories whenever he can. “I can be the stranger with the random act of kindness and if I change just one life for the better then I’ve made a difference,” he adds.